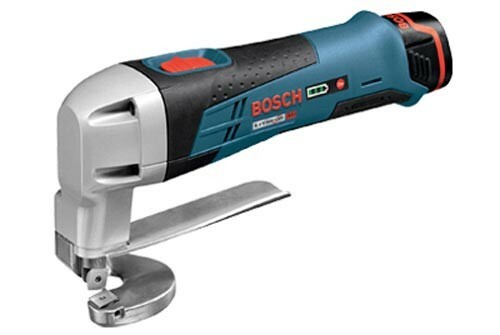 If you read Tool-Rank regularly, (like you should) you would remember me talking about the Bosch 12 volt cordless metal shear in Europe. It has now officially been announced here in the US via press release, and can now be found on the Bosch website. The listing for the PS70-2A has also reappeared on Amazon after its brief listing. The PS70-2A can cut metal thicknesses up to 18 gauge for steel and 12 gauge for aluminum, with a cutting radius as small as 1/4-inch. Being only 12 volts, it probably wont replace your corded shears for big jobs, but its portability is what is key. The PS70-2A kit includes two 12 volt Lithion Max Batteries, a 30 minute charger, one 4 sided blade, a feeler gauge, a hex key, and a carrying case.